Gabon with its capital Libreville is located in Africa (Central Africa, bordering the Atlantic Ocean at the Equator). It covers some 267,668 square kilometers (slightly smaller than Colorado) with a population of 1,772,260. French is the official language spoken by people in Gabon. Cameroon, Equatorial Guinea and Republic of the Congo are bordering countries. Gabon is a country in Western Central Africa. It lies on the Equator, on the Atlantic Ocean coast, between the Republic of the Congo to the south and east, Equatorial Guinea to the northwest and Cameroon to the north. In the 15th century, the first Europeans arrived. The nation's present name originates from Gabão, Portuguese for cloak, which is roughly the shape of the estuary of the Komo River close to the capital of Libreville. The topography is narrow coastal plain with hilly interior as well as savanna in east and south. The average density of population is about 7 per km². The climate in Gabon can be described as tropical with always hot, humid. To reach someone Gabon dial +241 prior to a number. The local cellular networks are operated on 900 MHz, 1800 MHz, 4G. Websites typically end with the top level domain ".ga". If you want to bring electric appliances (e.g. battery chaarger), keep in min the local 220 V - 50 Hz (plugs: C). The sign for the locally used currency Franc is XAF. 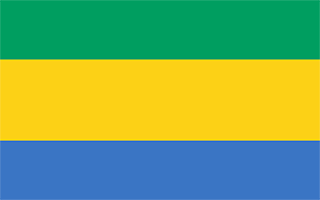 Three equal horizontal bands of green (top), yellow, and blue; green represents the country's forests and natural resources, gold represents the equator (which transects Gabon) as well as the sun, blue represents the sea. Following, independence from France in 1960, El Hadj Omar BONGO Ondimba - one of the longest-ruling heads of state in the world - dominated the country's political scene for four decades (1967-2009). President BONGO introduced a nominal multiparty system and a new constitution in the early 1990s. However, allegations of electoral fraud during local elections in December 2002 and the presidential election in 2005 exposed the weaknesses of formal political structures in Gabon. Following President BONGO's death in 2009, a new election brought his son, Ali BONGO Ondimba, to power. Despite constrained political conditions, Gabon's small population, abundant natural resources, and considerable foreign support have helped make it one of the more stable African countries. President Ali BONGO Ondimba’s controversial August 2016 reelection sparked unprecedented opposition protests that resulted in the burning of the parliament building. The election was contested by the opposition after fraudulent results were flagged by international election observers. Gabon’s Constitutional Court reviewed the election results but ruled in favor of President BONGO, upholding his win and extending his mandate to 2023.